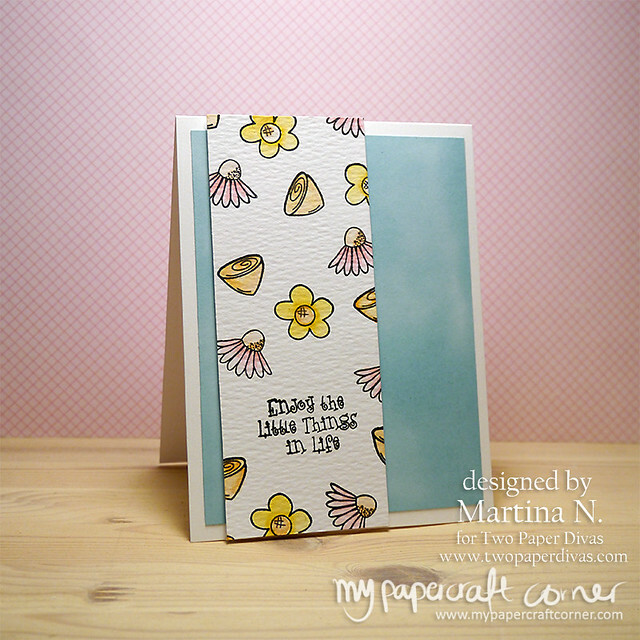 It's a little bit sad today because this is my last card for Two Paper Divas. It's been a great honor, a lot of fun and I've learned a lot and really enjoyed my time with Two Paper Divas and in the design team but there is a time for everything and at the moment I have had trouble getting time for everything in life. So this is a thank you card to Gayla and Melissa for giving me the opportunity to be a part of their team. Thanks! 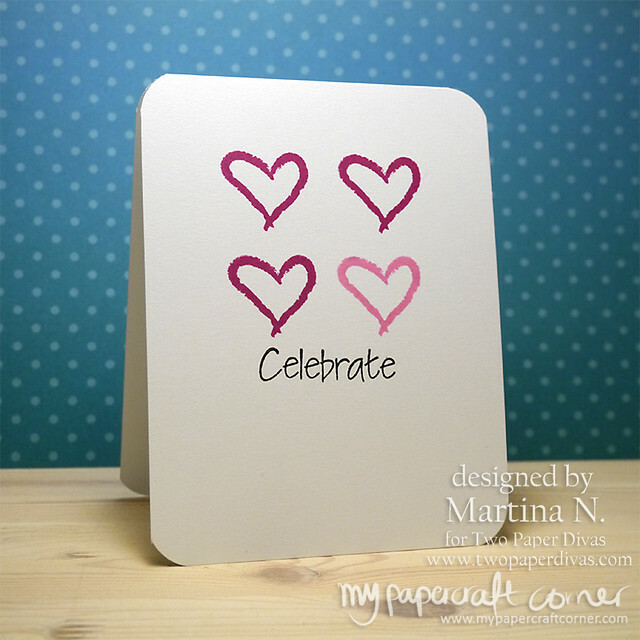 Can't stop playing with the stamp set Celebrate Life from Two Paper Divas. This is another very CAS card. Think I'm in a CAS flow at the moment. 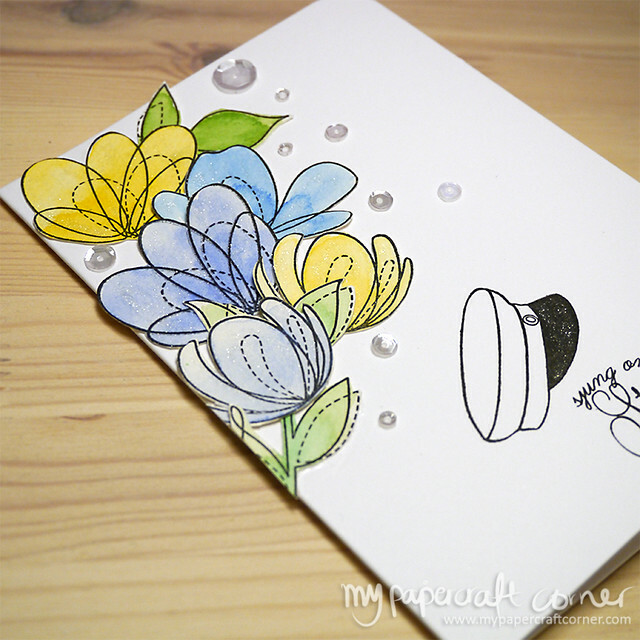 The idea for this card comes from Kristina Werner, but I used stamps for my card. Finally I had time to make a card for Kortskissen. This time it's for a person's 70:th birthday. Thanks for stopping by. 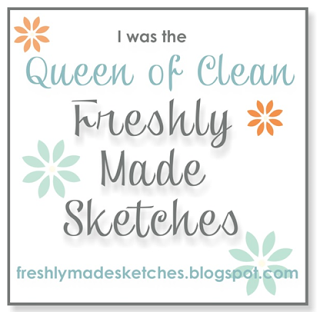 Please check out the sketch and get inspiration over at Kortskissen. 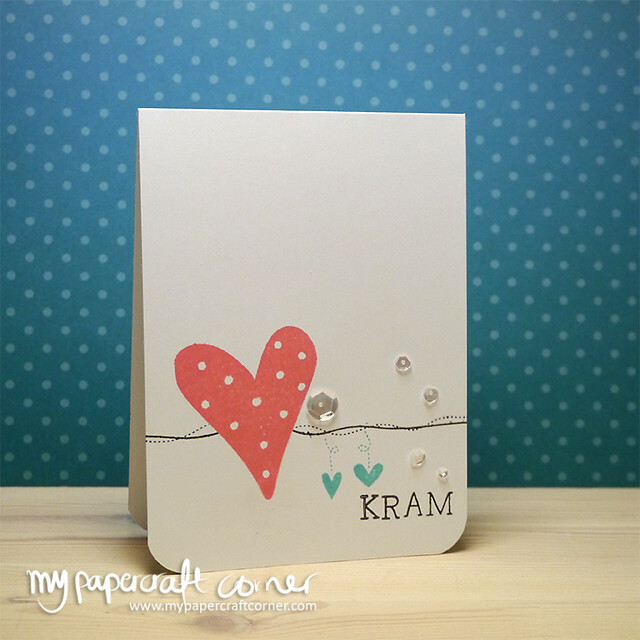 I really love the stamp set Celebrate Life from Two Paper Divas and today I played with the heart stamp and created this really clean and simple card. 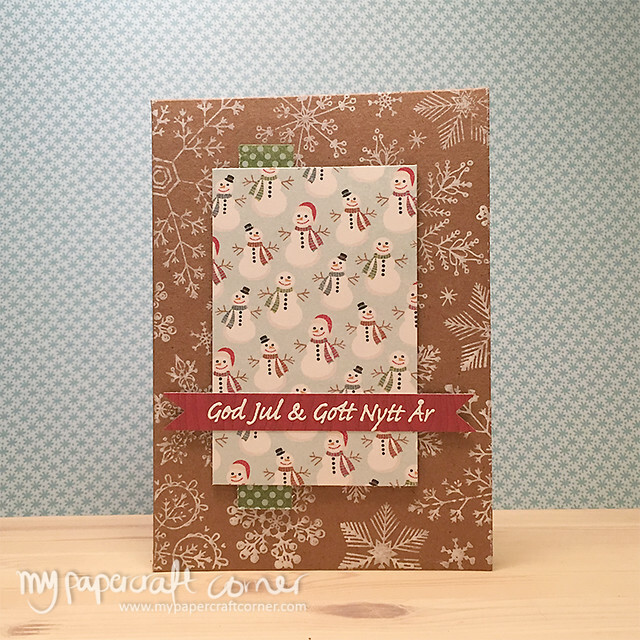 I'm entering the card to the challenge over at Less Is More. This week it's One Layer. 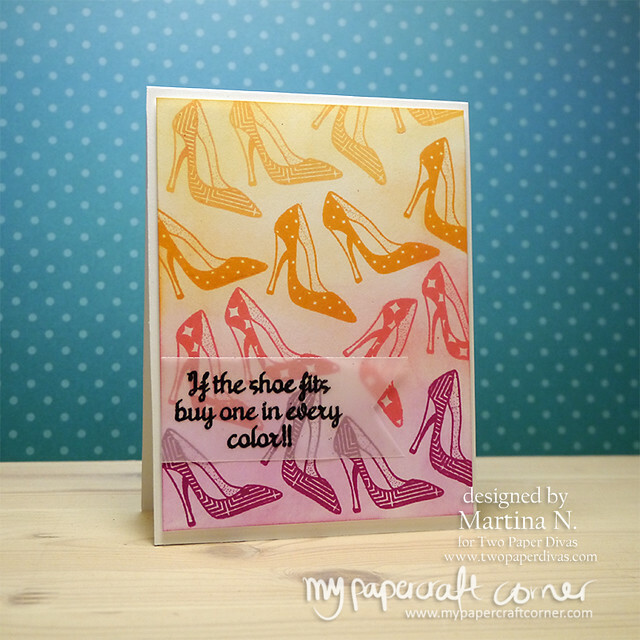 Have you seen the latest stamp release from Two Paper Divas? You can read more here and here. I absolutely love the set Celebrate Life and I have some ideas for this set. I couldn't choose color for this card so I went for rainbow colors. I got so inspired by Kristina Werner when she used a technique with stamping and ink blending and I really wanted to try something similar. 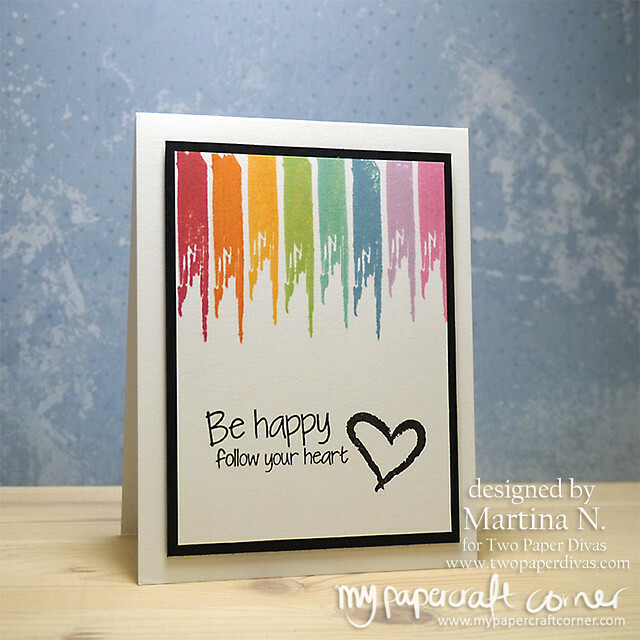 I used the stamp set You've got style from Two Paper Divas and ink pads from Hero Arts to create a rainbow effect. 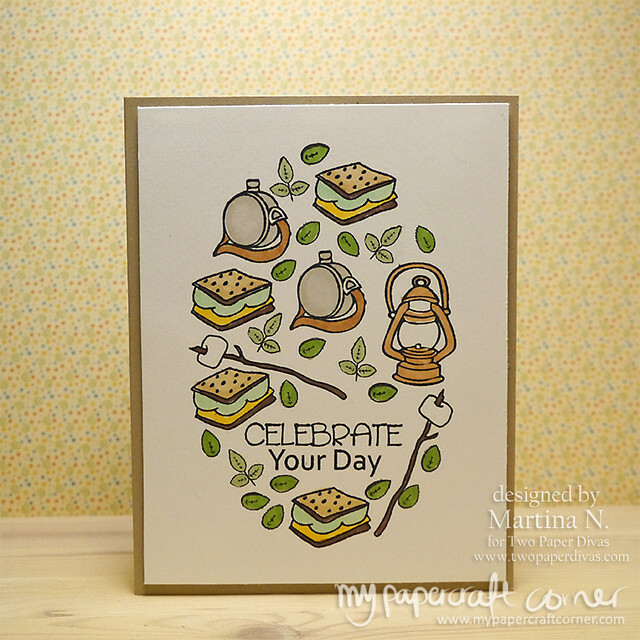 The sentiment from the stamp set was perfect for this happy colored card! For this tag, I got inspiration from the Jennifer McGuire. 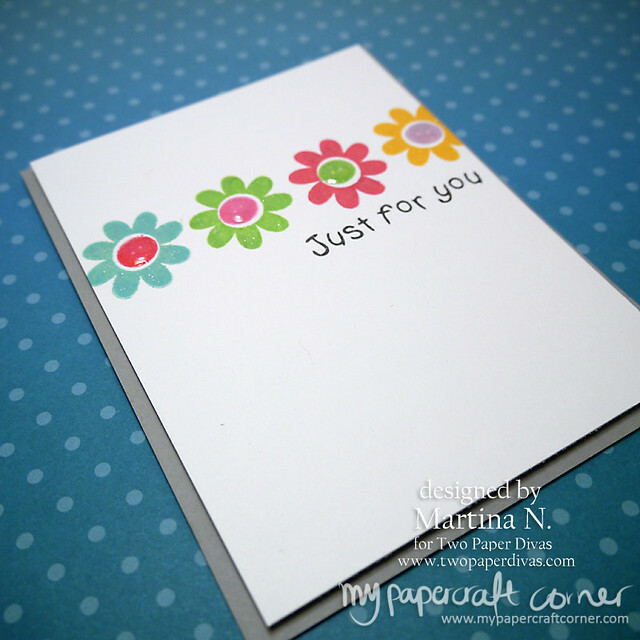 I stamped the sentiment and then distressed over it with different colors and I also used a stencil for the flower pattern. This is a card for Kortskissen. 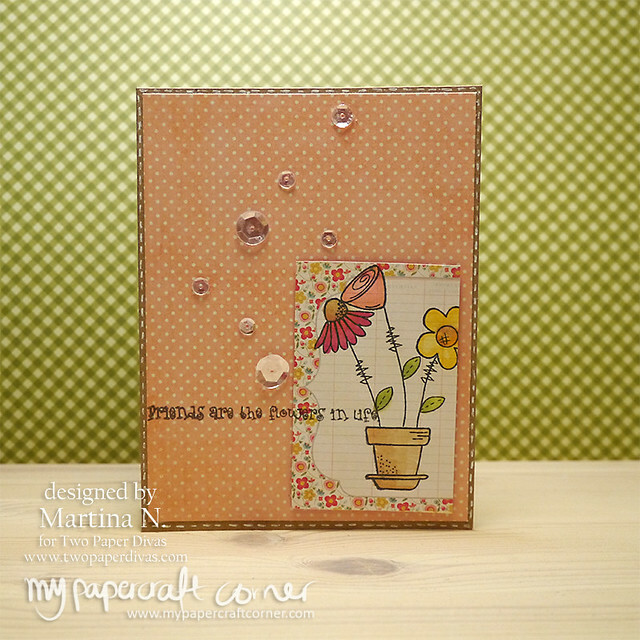 I created a one layered card with stamps from Inkadinkado, Lawn Fawn and Simon Says Stamps. I tried to use stamps in different ways this time. I used the stamp It's all about the egg to create balloons for a birthday card! The background is colored with Distress Inks. Thanks for stopping by and thanks for all your comments, you know who you are! 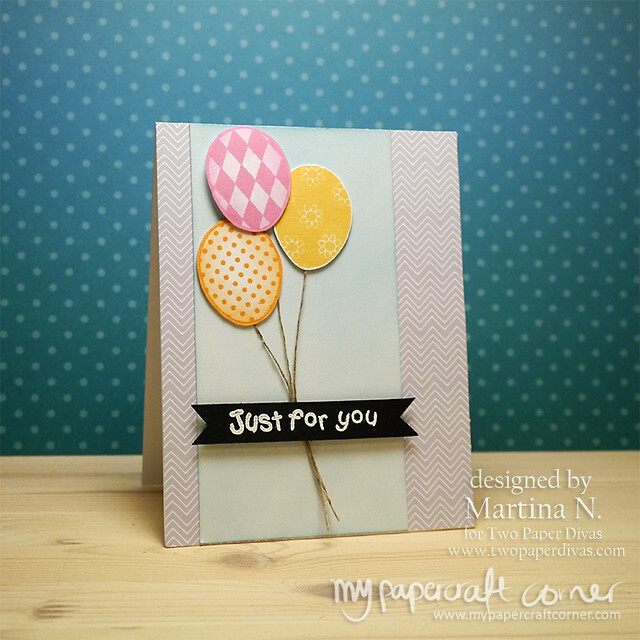 It's time for a new release with stamps from Two Paper Divas. 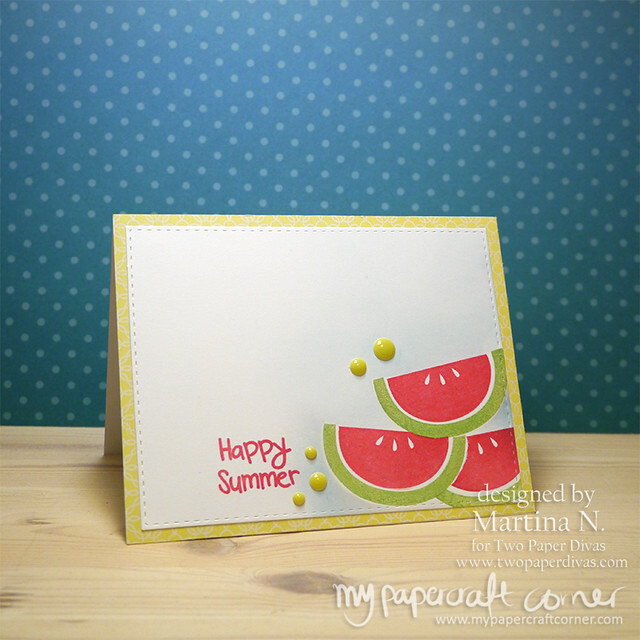 I love the new stamp set Melon Love and I created a really clean and simple one layered card in some bright colors. Hope you had a nice weekend. It's Monday and finally I had time to create a card for the sketch. I made a congrats card with some glittery embossing and patterned paper. 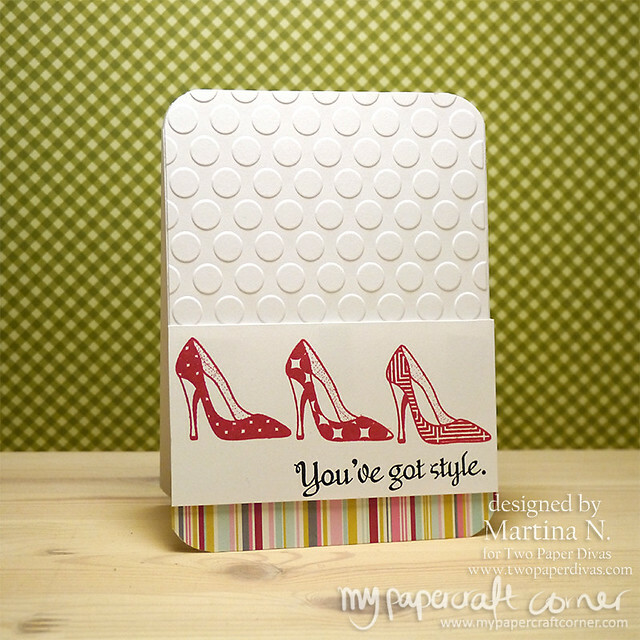 Wednesday and a new card with stamps from Two Paper Divas. 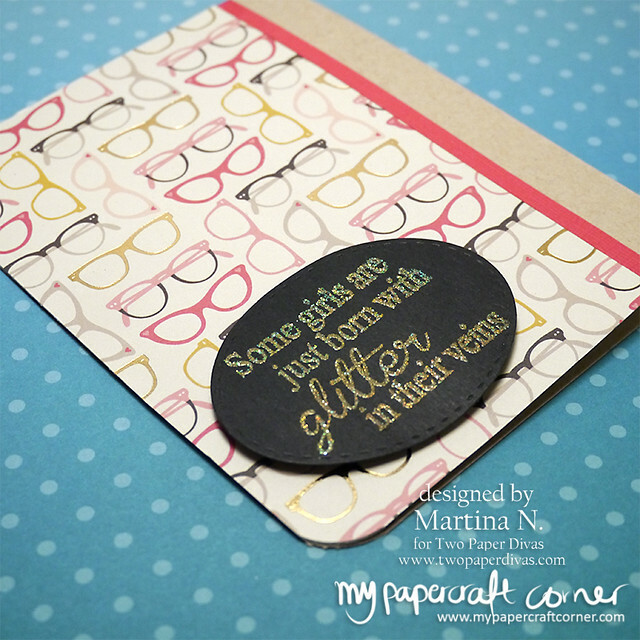 I like the sentiment stamp from the set Yes to Sprinkles 2 and I thought it would be fun to combine it with papers from My Mind's Eye "My Story" collection. 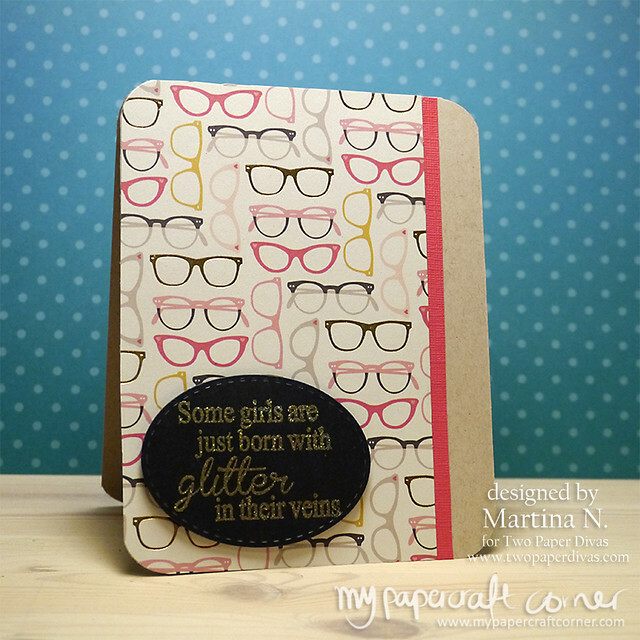 I like the paper with some foiled glasses together with a glittery sentiment! 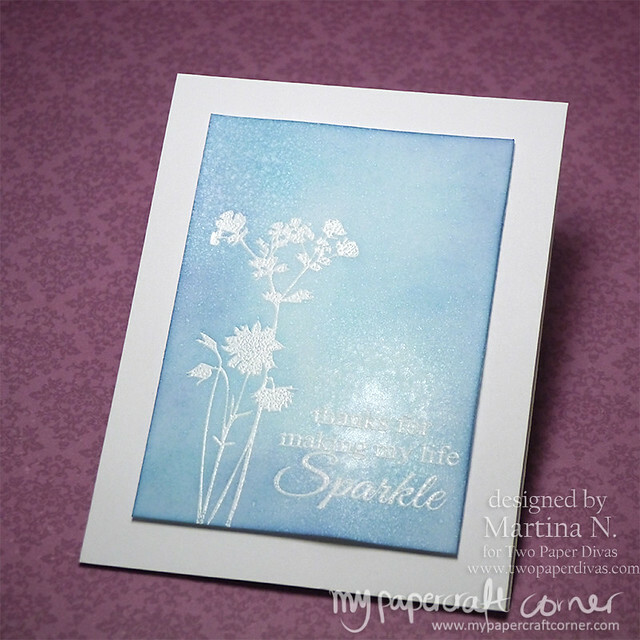 I used the embossing powder Enchanted gold from Ranger. 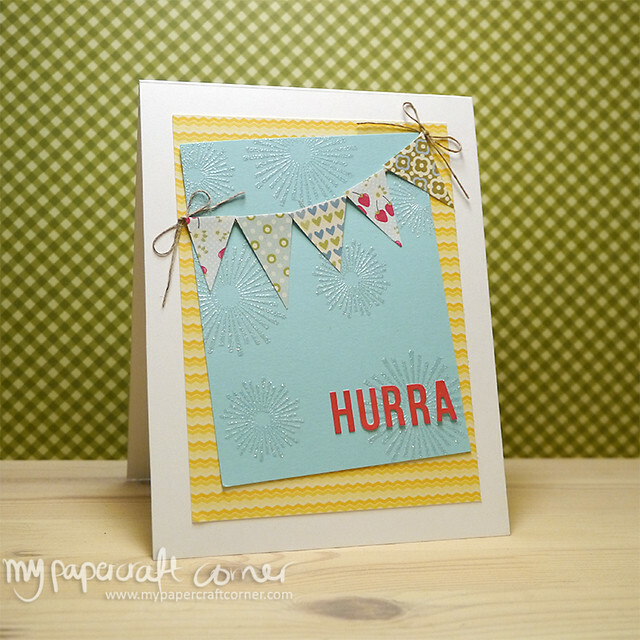 Today I'm sharing a card where I played with som paper piecing. 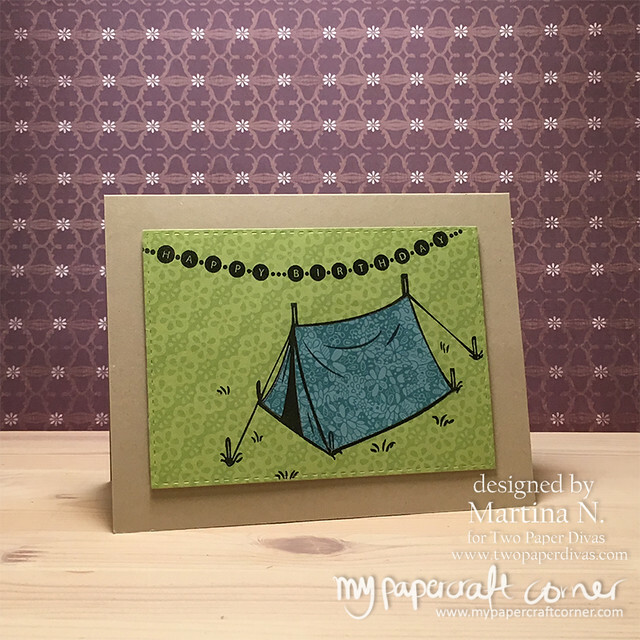 I used the tentstamp from Two Paper Divas which I think is perfect for a more masculine cards. 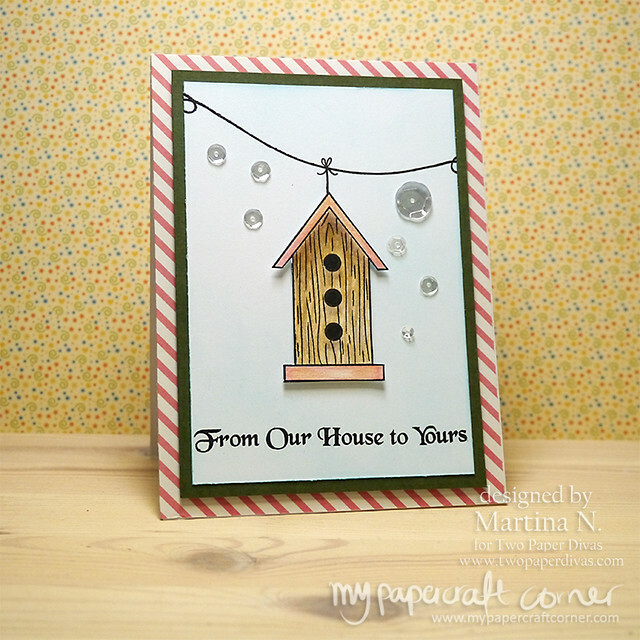 I love the new cute stamp set with the bird houses from Two Paper Divas. I combined the stam set with the string stamp from Wanna Hang Out. The stamp is colored with Polychromos colored pencils. This Monday I share a new card based on a sketch from Kortskissen. It's a graduation card for a student in Sweden, so I used the Swedish colors. I played with my watercolors finally used my new flower stamp set from Simon Says Stamp. Hope you had a nice weekend. I have been enjoying a long weekend with beautiful weather. 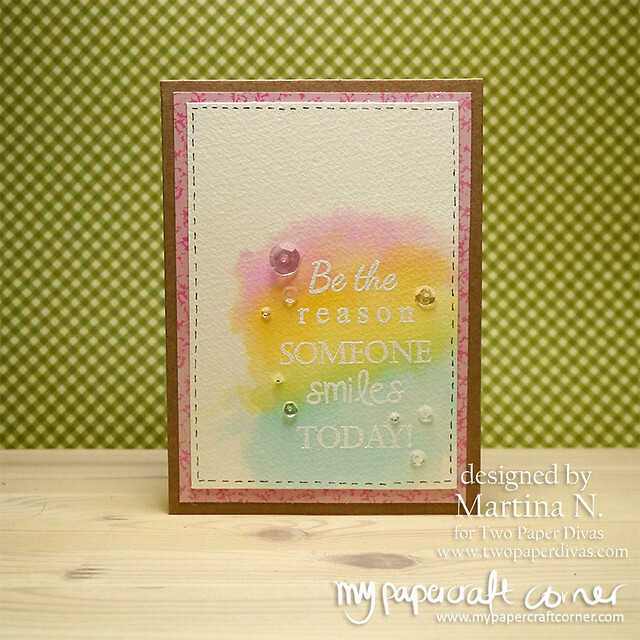 I saw a color challenge on the internet with pastel colors, and that's whats inspired me for this card. I just played with my Distress Inks and water. 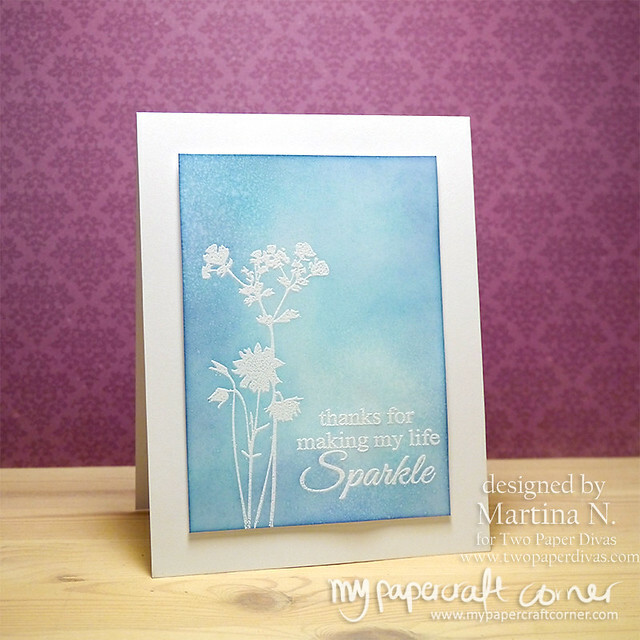 I white heat embossed the sentiment from Two Paper Divas over the water color. 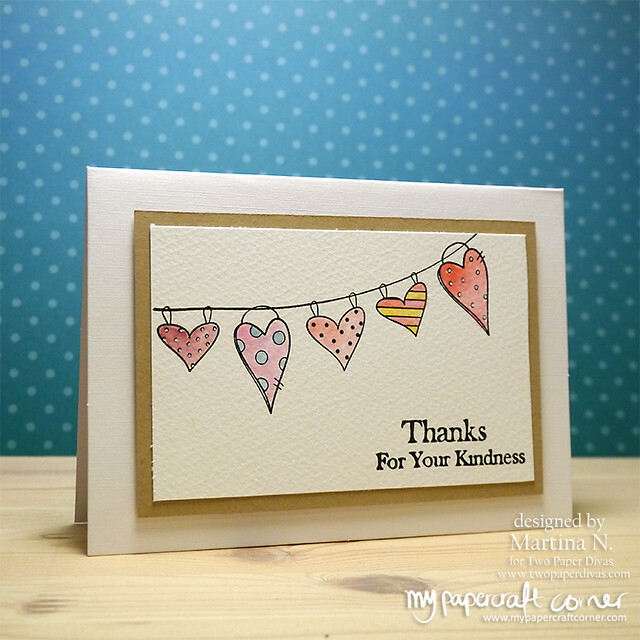 Today I'm sharing a card with stamps from Two Paper Divas. I used a sketch from Retrosketches as an inspiration. I couldn't resist stamping the shoes in red and add shimmer with my Wink of Stella clear glitter pen. The background is embossed with an embossing folder. This Monday I share another card based on a sketch from Kortskissen. I played with my watercolors and used them to create a loose colored flowers panel. 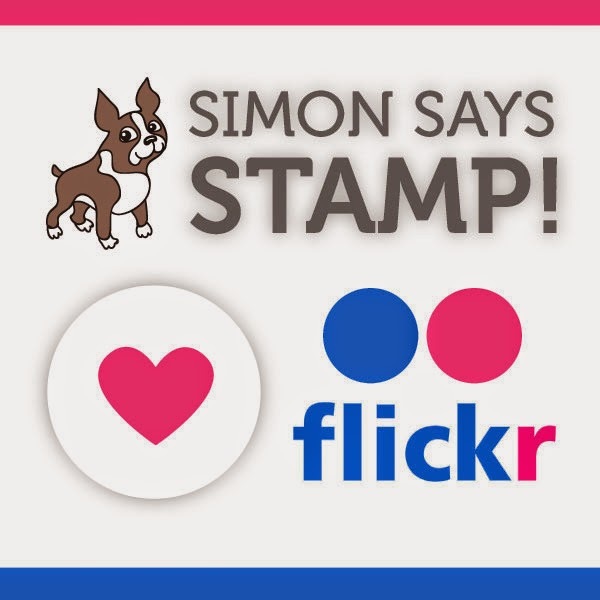 The stamps comes from Simon Says Stamp Petal Pieces and I build the sentiment with the Lawn Fawn stamp set, Milo's ABC's. 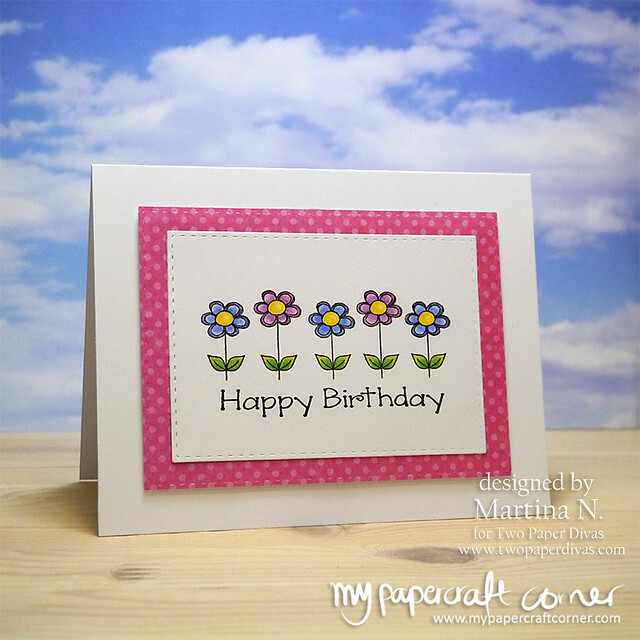 I can't stop using the flowers from the Funky Flowers stamp set, so here is another card with them. I colored them with Distress Inks. And I really love the happy sentiment, Be the reason. I hope I can make someone smile with this card. 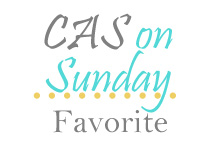 Today I'm sharing a very CAS card. 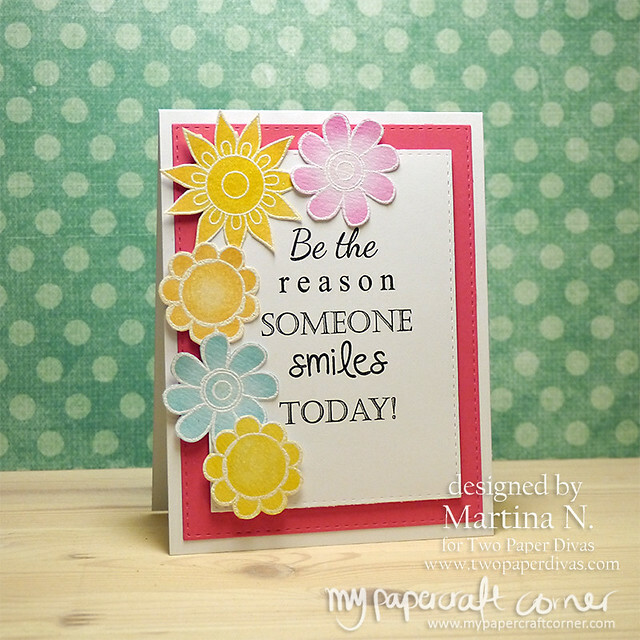 The stamp comes from Two Paper Diva's latest release and I colored the flowers with Polychromos colored pencils. 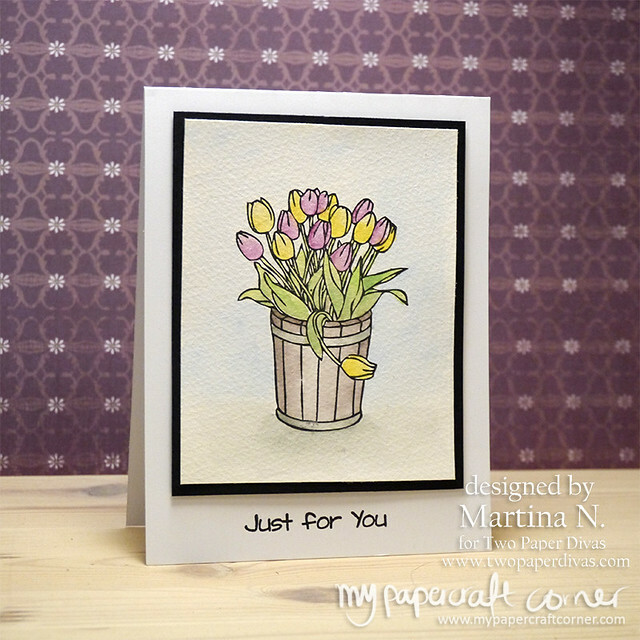 Hope I can share some feelings of spring with this card! 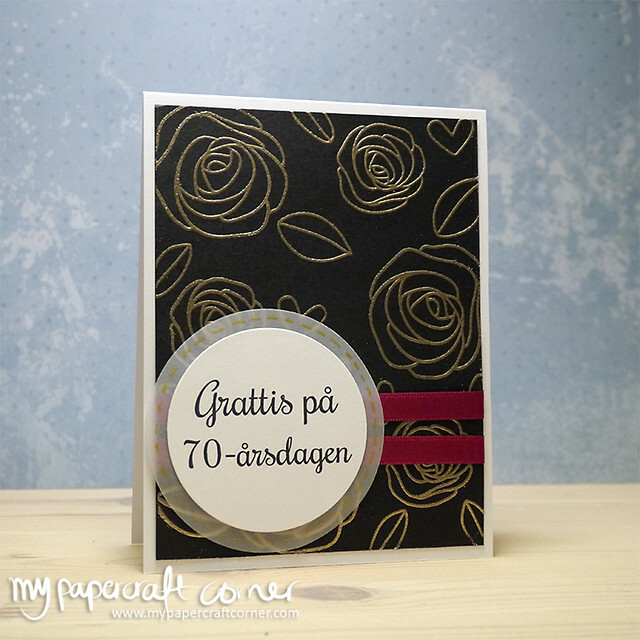 Today it's a new card based on a sketch from Kortskissen #352. I used an older watercolored background panel that never ended up as a card, but I decided to use it for this one. I stamped the hearts in black Versafine Ink. The sentiment from Gummiapan is white heat embossed. Please check the other cards at Kortskissen #352. 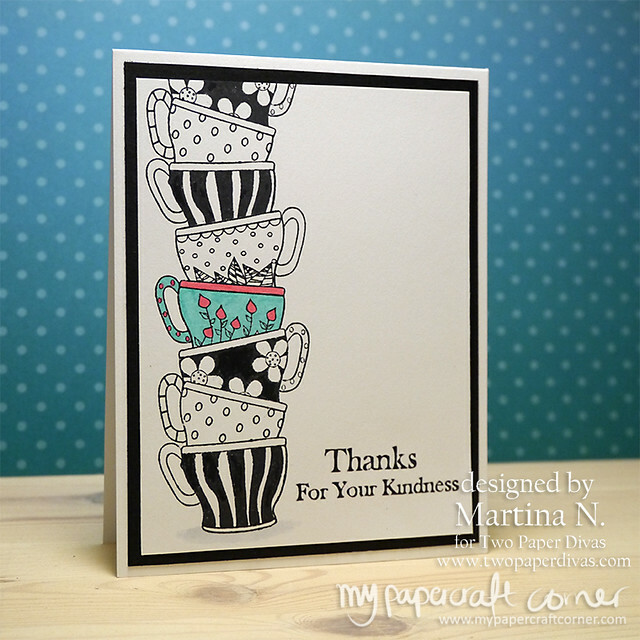 Today it's time for a new card with stamps from Two Paper Divas. I found the flower challenge on CAS on Sunday and I thought the Flower Silhouette from Two Paper Divas was perfect. 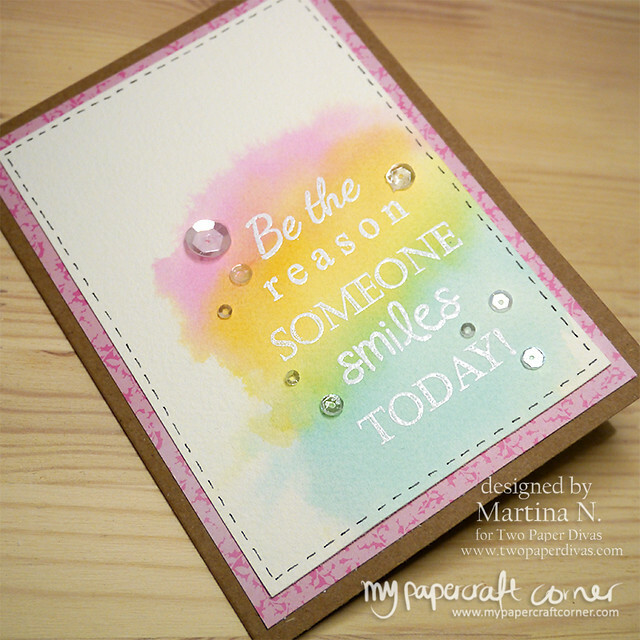 The sentiment comes from the new Two Paper Divas release and I added Perfect Pearls to the background for some sparkle and shine.